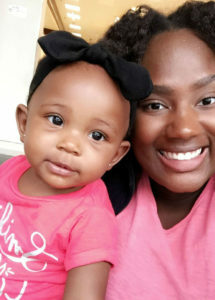 The Pregnant Scholar team is proud to feature this conversation with Kamaria Downs as part of our Pregnant Scholar Profiles. 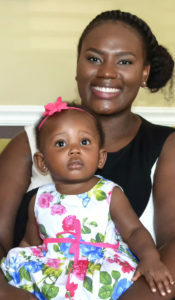 When Kamaria was a senior at Claflin University, the University evicted her from student housing because she was pregnant—a violation of Title IX’s prohibition on discrimination based on pregnancy. Kamaria successfully challenged the university’s rules, with help from attorneys at Public Justice and Correia & Puth. As a result, the university revoked its discriminatory housing policy, created new housing and anti-discrimination policies to support pregnant and parenting students, agreed to hire new Title IX personnel, and expanded its Title IX training and outreach for students and staff. When did you have your daughter? What did you expect it would be like to be pregnant in college? I was a senior and I was in my last semester when the entire ordeal happened. I had always intended to finish my degree. I never had a doubt in my mind about graduating. What was your university’s response to your pregnancy? The University found out [I was pregnant] when I went to student teach and they had a form that I had to fill out to disclose any and all of my medical information. Evidently that information wasn’t kept confidential. My dean called me into her office a few days after I submitted the form, and she was telling me that I’d have to move out because I was pregnant…Nobody else confronted me about it until a couple of months later when I was called into the housing coordinator’s office. She asked me if I was pregnant, and I told her ‘yes.’ She basically told me the same thing; ‘you know, you’re going to have to move out because you’re pregnant.’ At that point I was just telling her ‘give me a few days to find some living arrangements.’ Thankfully, I had been in a conversation with my professor/mentor, because she knew they were going to drop the ball on me. She opened up her home to me and let me know that if I needed to stay there with her I could. What led to your decision to challenge the policy against pregnant women in dorms? After graduation I actually took a year off to be with my daughter–and just sitting there enjoying her, watching her grow every day and change every day, it made me realize that in the beginning I was literally concealing my pregnancy from everyone just because I was afraid of what the university would do. It made me realize that I didn’t get to enjoy my pregnancy and it isn’t right. It’s not right for me to feel shamed for being pregnant just because I’m unmarried, or just because I’m still in college–that doesn’t matter. And so I wanted to prevent it from happening to other people. I wanted to prevent another woman from feeling as ashamed of her pregnancy as I did. Unfortunately it still happened to some other people after I graduated, but at this point I’m sure it’s not happening any more! Once you came forward, what was the response like? I logged into my university email…when the settlement was finally made, and I saw the email that they sent out to the entire university thanking me for coming forward with my story and helping to change the policy to make it equal for all people within the university. And [I saw] the response for an interview I’d done—a ton of my friends shared the link and everyone has been telling me how proud they are of me for standing up for what is right. Overall the response has been very good and I’m so excited about it. And I’m very appreciative that Claflin made the changes that they did. What advice would you give to other pregnant students? I would just say that it is still possible to graduate, don’t doubt yourself or what you can do! Think about your children; you’re doing this for them. And I would just say, to anybody, know your Title IX rights. What about professors, any advice on how they can support pregnant students? Be open to change. I know a lot of universities have a policy against pregnant and parenting students, but you have to be open to everyone and be able to accommodate them. It’s just wrong to treat people the way I was treated. Instead, provide avenues for them to finish their degree and be able to take their classes without any hassles or having them go through the runaround to get things done. Just be helpful to those in need and don’t look down upon them, I feel like that’s how it was at my university. A lot of leaders and administrators looked down on me, because I’m unmarried, I’m pregnant, I’m still in college. Don’t be condemning of people, don’t look down on them; that’s the worst thing possible. You’ve now graduated, what are you and your daughter up to? She is one year old. She is so smart and full of energy and everything I could’ve wished for. I am currently teaching 2nd grade in Greenville, South Carolina. And I’m in my first year. It has been my dream to be a teacher, and now I’m actually waking up and living that dream while at the same time having my family and just enjoying life. Each month we share insight from a student parent who stayed on the path to achieving their educational goals. Click here to nominate a current or recent student parent for an interview.